Chevron stripes, also known as zig zag stripes, are one of my favorite patterns. Lately, I've become just a little bit obsessed with chevron. It's a modern and chic spin for inspiration for everything both big and small. 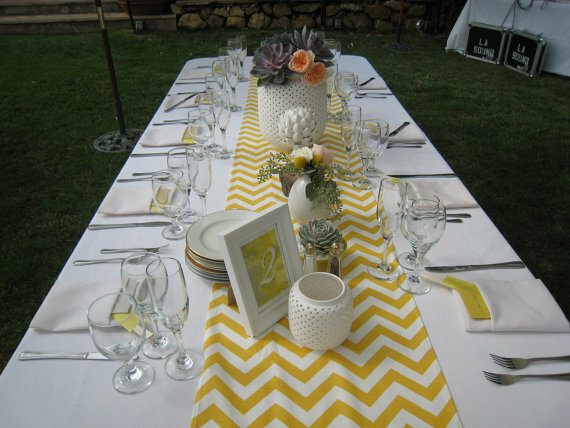 Although chevron has been a decor trend for a few years, it's still wildly popular. I love it that chevron can take over a room or just add a small accent to a neutral palette. When I discovered this table runner on Etsy from fellow Marylander Longrunners, I fell in love. This adorable table runner is ideal for an Easter Buffet, party, or any spring event. Wouldn't pink look amazing with the yellow contrast of the chevron pattern? Since Longrunners gets her fabric at Fabric.com, you can choose any fabric that you see, send her the link, and she'll custom make whatever you love the most. How wonderful is that! 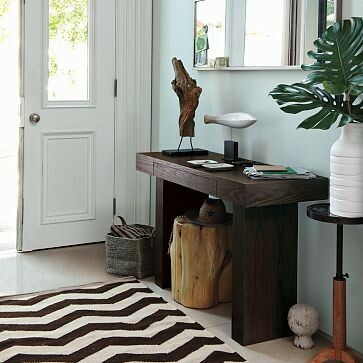 The Chevron Rug from West Elm is an excellent way to make a bold statement in an entry or mud room. I love the idea of using a large chevron pattern on the floor. 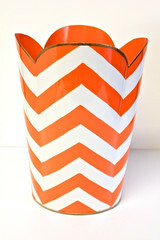 A while ago, I picked up this Chevron Orange Tulip Wastebasket from Jayes Studio﻿ on One Kings Lane. Since then, I've added quite a few things to my chevron wish list. Chevron stripes are adorable from everything from stationery to sofas! What are your favorite items in a chevron print? Love love love! I think pillows look great in Chevron too!